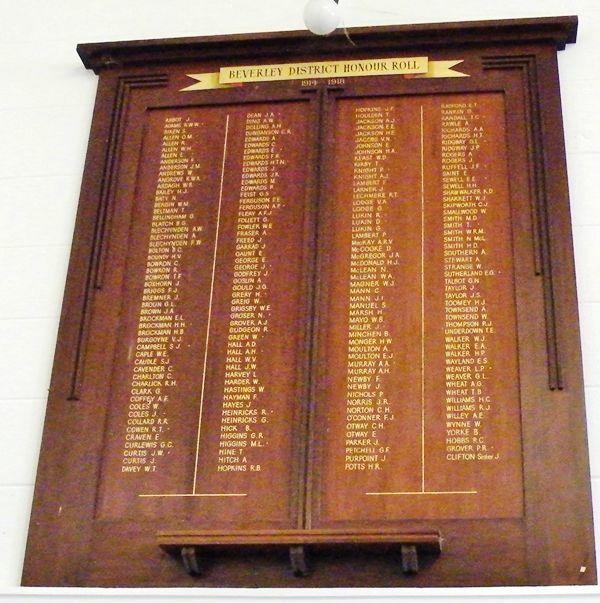 Two polished jarrah honour boards, bearing the names of nearly 500 men and women of the district who served in both world wars, were unveiled by the Acting-Premier (Mr. Watts). The boards have been mounted flanking the main entrance of the Town Hall. Introduced by the chairman of the Beverley Road Board (Mr. L.W. Doncon), Mr. Watts referred to the tremendous sacrifice of lives and wealth which the Empire had been called upon to make in 1914-18 and again in 1939-45. The West Australian (Perth) 18th August 1947.